Got a 160 Gig Maxtor Hardrive for G4 QuickSilver.Only got 127 Gig.Put Sonnet Card in No need to load any software or drivers, Now I get all the space that is supposed to show.152 Gig.No problems.Rom on current shipping models supports large drives. Great product!!! love the ATA 133 speeds...my only gripe is I can only use 137 gigs of my 160 gig Hard drive...and it comes with the firmware for OS9.... so you have to upgrade the firmware for OSX. way better than my old ATA 66 though....yippee! Poor support. Fix for 8MB buffer hard drives a year late! I purchased this controller card over a year ago (2002.) I connected an 80GB hard drive with an 8MB memory buffer on this controller as my secondary disk. The card seemed to work without problems. I decided to use this faster 80GB hard drive as the primary disk. So I upgraded to Mac OS X 10.2 and installed the operating system on this disk; that is when the problems started. Intermitently it would stop at the grey (hardware) boot screen. Other times it would crash the machine during the initial boot sequence and drop to the Open Firmware prompt, where the only option was to type shutdown; mini-computer sysadmin deja-vu. I also noticed this controller could only find the HD if connected to IDE channel one. I tried moving the stock HD to this controller, but it couldn't boot either. After countless installs of the operating system (MacOS X 10.1 and 10.2) and not have it work, I found the latest firmware for this controller fixes problems with hard drives that have an 8MB buffer. Fixed in March 2003, more than a year after the product has been available! I recently updated the firmware and can now boot 10.2 from it. No problems so far. The firmware update program is only available for MacOS 9. Be warned if support is important to you. This is the WORST RAID card I have ever purchased. It drops drives left and right. Adaptec has a firmware update, but you have to completely rebuild the arrays to install it! This card is VERY unreliable. I waited on hold, never speaking to a single soul, for over an hour at Adaptec's support line. I finally just gave up. Connect with SlimSCSI 1480B and dramatically improve system I/O performance. Enjoy the same fast performance and multitasking you'd get on a desktop PC--plus the convenience of instant plug-in connections and hot-swaps. PC Cards use so much CPU capacity that even a simple screen redraw becomes time-consuming, and multitasking becomes impossible. SlimSCSI 1480 handles data transfer at the bus level, rather than leaving it to your system CPU. So blaze away in the application of your choice, while other tasks continue in the background. 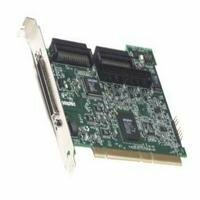 Adaptec's CardBus-to-Ultra SCSI adapter delivers full 32-bit PCI performance at speeds up to 20MB/sec, allowing your high-performance devices to operate at their maximum rated speed. The SlimSCSI adapter's on-board microprocessor manages all the I/O requests, leaving the CPU free to manage other tasks. Installing SlimSCSI peripherals is quick and effortless, with full Plug-and-Play support under Windows&reg; 95 & 98. You can operate up to three SCSI devices simultaneously through a single SlimSCSI 1480 and detach peripherals without having to reboot your system. Battery life is critical to the portable user. SlimSCSI 1480 is designed to the 3.3 volt standard, so it consumes virtually no power. Adaptec is the industry standard in SCSI connections, guaranteeing great performance and the utmost in reliability and compatibility. All Adaptec SCSI products are backed by a 5-year, limited warranty and full technical support for one year. I purchased this card because I upgraded my ASUS Mother Board. The new board had no ISA slot that had been used by my previous HP provided card. The Adaptec card fit easily into one of the new board's PCI slots. Windows XP Pro found the new hardware and configured my ScanJet 4P (HP scanner) for immediate use! This was the easiest upgrade I have ever done. Thanks for providing another fine card to assist with upgrading to faster platforms. By far, this is the worst product experience I have ever had.After installing in my computer, my SCSI drive could no longer be read.I contacted Adaptec customer support and they refused to help me until I could get an ID number off the card that I could not get until I booted.I pulled out the card to get the ID number and it fried my motherboard. 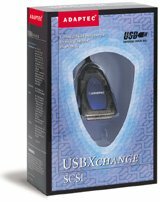 After getting my computer back from repair, I purchased an LSI Logic SCSI adpater.It worked perfectly and automatically reading the drive that could not be read by Adaptec. Be warned -- Adaptec used to be great and is on the decline.It is a ghost of its former self. Adaptec continues their reputation for solid design and performance. 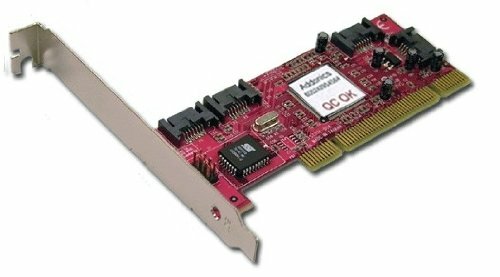 I updated an older Adaptec ISA SCSI card (which never gave me a problem in over 5 years) with this one for a PCI slot, and everything worked perfectly.As usual with Adaptec, I didn't need to load a driver.Win XP detected the card and loaded itautomatically.Great product! Have no idea about this product!! In fairness to Adaptec, I gave it 5 stars. But I never received it because Amazon.com just sent me an email that they cannot obtain this item. And this is despite it being listed as "usually" shipping within 24 hours. That's what it said when I ordered it and that's what it says as I post this. Come on, Amazon, if you don't stock it just say so. I needed this card to interface my HP ScanJet 6100C flatbed to my Dell 8100 - which, unlike my previous machine, had no ISA slots for the SCSI interface which HP originally supplied. I was expecting a fight, but was pleasantly surprised - installation under a Windows 2000 system was a piece of cake - the card was recognised instantly, no additional configuration required. I downloaded the latest scanner software from HP and everything worked perfectly first time. Keep your storage options flexible with the ADS USB 2.0 Drive Kit, which enables you to convert an IDE Ultra DMA 33/66 or ATA-100/133 hard disk drive into a USB 2.0 drive simply by plugging into the ADS Native Bridge Board inside the enclosure. With USB 2.0 connectivity, you'll get the maximum data throughput for your external drive--sustained data transfer rates up to 35 MB/second--that's essential for multimedia storage and video editing. Plug & Play compatible and hot swappable, the USB 2.0 Drive Kit is ideal for those who do not want the installation hassle of SCSI devices. This is garbage.I used it once and then the power supply sorta gave up--it just flickered and couldn't even power the fan.I looked at the manufacturer's website and they have absolutely no troubleshooting or helpful information for this device. The near immediate failure of this unit really put me in a bind.I needed the files on the hard drive to meet a deadline--needless to say I did not meet it. Don't waste your money on anything from this manufacturer. Stay away from this enclosure if you want to use it under Linux. Whereas its read speed is good (180 Mbit/s), its write speed is bad (6 Mbit/s). For comparison, when I install the hard drive directly in my desktop, the write speed is 130 Mbit/s. I asked ADS Technologies for help, but they just told me that they did not support Linux. The fan seems cheap and became very noisy after two months. I got an error trying to install this card. I do this for a living so I ought to be able to install a simple PCI card. But not this time. I spent the extra money on the name-brand card because I read about the Adaptec Support from other reviewers. Well first, their website was useless. The suggestions they had were'nt even close. Then I decided to talk to a live person - but wait! You need a credit card and have to pay $10 for phone support. So I e-mailed a detailed description of the problem to them. After 48 hours, no reply. I found a MS KB article that told me exactly how to fix the problem. As with all Adaptec products I have used, this one worked right out of the box with no problems. Microsoft must have fixed the problem in Windows XP Pro, because I installed this card without any problem in a system running Windows XP Pro (SP2). You can't go wrong with this card and it's worth the slightly higher price to eliminate installation and support problems! Everything worked right out of the box!The installation was flawless and the software worked.One tip might help, I installed this on Windows 98 SE and it helps to pop the installation disc in and print out the pages of the guide for your particular system and have them handy.Otherwise you will be at the mercy of the Windows installation wizard and it's choices. Painless installation and flawless performance! I recently purchased a 4 megapixel camera, and I found that it took much longer to download the larger picture files it produced than the pictures from my old 2.0 MP camera, (using a CF reader with USB 1.1). I was also getting more errors, like refusing to open a preview picture, and occassionally freezing the whole system. Since I do a lot of photo editing, I decided to upgrade to USB 2.0. 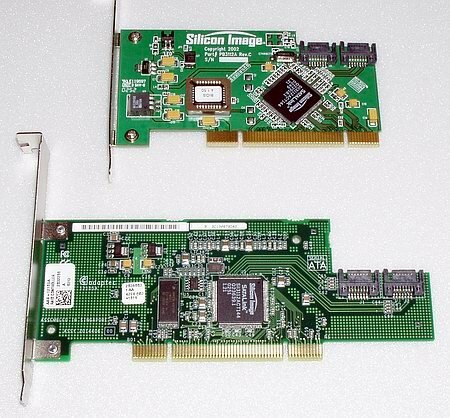 I installed this card in a 866mhz P3 Dell w/512mb RAM, running Windows 98SE. Installation of the card and the software was simple, and it works flawlessly. Used with a new USB 2.0 card reader, the speed is unbelievable, even when uploading images to a website and downloading and editing photos at the same time, with no glitches or errors at all. I had purchased a similar card (Belkin F5U220) from a different vendor, but it caused numerous system crashes, and when I called Belkin tech support, I found the rep to be inept and surly. I highly recommend this Adaptec product, and Amazon's service was superb, as usual. The card itself is nice and there's a lot of documentation and support available at the company, which is a switch from the generics that I normally buy.This card is replacing a generic which didn't function all too well and had no support. The USB view software is amazing.I now can see a map of all of my legacy and 2.0 USB devices, including printers, drives, camera, MP3 players, etc. Now you can take high-speed USB connectivity wherever you go. You get compatibility with today's most popular peripherals and the new, exciting ones. 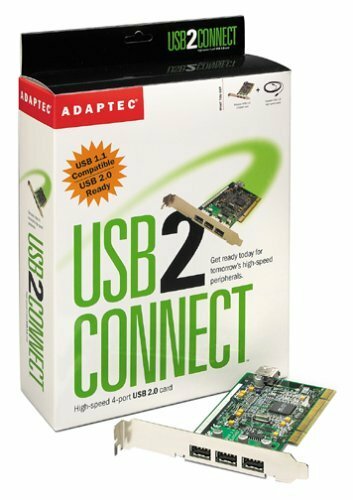 The USB2connect for Notebooks kit from Adaptec enables your PC or Mac to work with both USB 1.1 and 2.0 devices. When you're on the road, you'll also appreciate that our solution doesn't require an additional power brick to add weight to your bags. Enhance your computer's portability and performance with USB2connect for Notebooks. Works on both Macs and PCs - universal design works on PC-compatible computers and Macs as well. Doesn't work with flash drives.Avoid this one. Because this card DOES NOT come with a power adapter (the Belkin Cardbus card does, and I'm ordering one after I send this one back) it would not work with my flash drives.One it would not see at all, and the other it would see but not access. I assume it works O.K. with low or non power devices such as USB keyboards or Mice, or with devices that have their own power supply such as an External USB hard drive, but I've tested neither.I just know this one is 15 dollars more, then you need to turn around and buy the adapter, which is not even listed on Amazon? Also, the driver installation was a pain because after Windows XP installs its drivers, you have to disable all the USB controllers on the card, download the Adaptec driver, then it will install the Adapted drivers.That took me about an hour to find on the Adaptec website.I'm a technician and I do this kind of thing all day; it should not be this hard. I bought this item after a bad experience with an ADS Technologies card (see my review for that one) that did not work. At first I was hesitant to shell out the cash for the Adaptec, but I was so desperate to find a USB2.0 PCMCIA card that did NOT require an AC adapter. I have an HP Pavilion ZT1180 notebook, running XP Home SP2. Older, but a great notebook. The biggest drawback of my notebook is the lack of USB 2.0 ports (they are all USB 1.1). I needed a card that I could use with my 802.11 SuperG usb dongle and did NOT require an AC adapter. What's the point of being wireless if you still have to plug in the card! The card is basically Plug and Play. I popped it into my notebook and it was rarin' to go (after the usual XP prompts to detect drivers, etc). I did not need to run the included CD-ROM, nor did I need to go to the Adaptec website for updated drivers. XP Home SP2 had the drivers for it. The card was able to support and provide enough power for my wireless USB dongle like a pro and I was able to surf at 108 mbps! I am EXTREMELY pleased with this card. I have not pushed the card by trying to install another usb device that would require power. There is a jack for an AC adapter, but no adapter was included with the product. You could probably pick one up easily at a Target or Radio Shack if necessary. I have to say that it is worth the price (hence 5 stars) because of the power issue. Similar cheaper no-name or generic brand cards aren't capable of providing enough juice to power a simple USB dongle. - Go to the Adaptec trouble shoot website and follow the instruction for work around to overwrite the WinXP SP2. - Reboot then you will be fine. Note: - Linux setup for this is a lot easier. so make sure to check it out. I have a Sony 2.0 G VAIO with Windows XP.Under this environment it was just a matter of plugging it in and the drivers installed themselves automatically.I did not even have to open up the driver CD that accompanied the CardBus.Very impressive if you ask me.I am backing up my files as I am typing this with no problem onto my 160 G external hard drive using the fast USB 2.0 technology. First of all, this has to go in the top PC slot, because it is bulky. Second, I couldnt get it to work with my notebook (running ME).The lights stayed red. Most importantly, and the reason I didnt pursue trying to get it to work for too long, as a previous review said, the card interfered with my wireless connection.My wireless nic card below the usb adapter couldnt hold a signal, even without the usb card working. The Adaptec SCSI Card 29160 is tailored for entry to mid-range server environments. 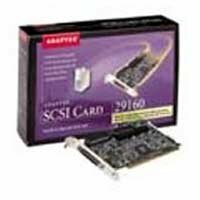 It delivers the maximum throughput for a single channel Ultra160 SCSI card by using a 64-bit PCI interface. 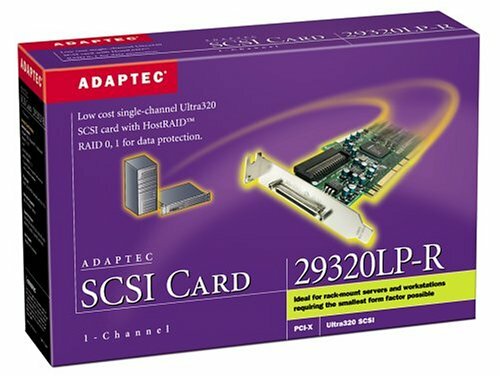 The Adaptec SCSI Card 29160 provides the ideal connection to Ultra160 SCSI (LVD) hard disks and devices (internally and externally) and legacy devices (internally). Allows Your Mac to Utilize Hard Drives Larger than 137 GB. 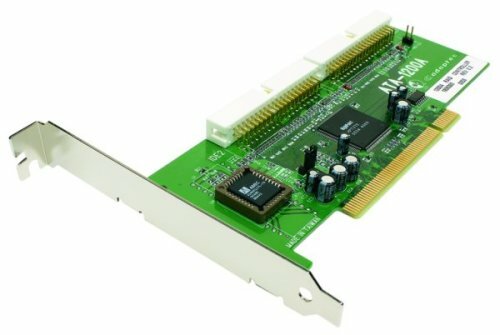 I own a 2001 Quicksilver G4 (OS X 10.4.1) that came with an 80 GB Western Digital Hard Drive.I do film work, so I need lots of space.I purchased a Seagate 300 GB Serial ATA Internal Hard Drive and this card (Sonnet's Tempo Serial 2-Port ATA PCI Adapter Card) was required for my Mac to read all 300 GBs. Do you need this card? If your computer is a 2002 Quicksilver or newer, then your computer is equipped with 48-bit addressing and you do NOT need this card.Your computer can read hard drives larger than 137 GB. If your computer is a 2001 Quicksilver(like mine) or older, then you DO need this card in order for your computer to use hard drives larger than 137 GB. I have been building and using comptuers for 15+ years and this is the hardest piece of hardware I have EVER had to install.I could never get it to work reliably with XP (SP2) or Server 2003 (it would work fine with Win. 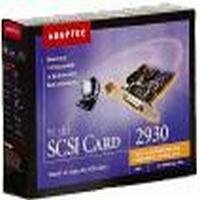 2000).I followed the instructions to the letter on the Adaptec site but to no avail.Sometimes my computer (XP) would boot fine, other times it would lock up.I finally gave up and went with software RAID which worked perfectly.Save your money or purchase another card if you are using XP or Server 2003. For anyone struggling to find information about properly installing an Adaptec 1200a into a Dell workstation running Windows XP Professional + SP1. I found the Adaptec documentation lacking the necessary, detailed information. * My old Maxtor hard drive failed so I removed it from the case and replaced it with one of the new Seagates. I did not change any BIOS settings and the new drive was plugged into the Primary IDE channel, just like the old one. * I reinstalled XP by booting from the CD-ROM. Once XP was installed, I installed Service Pack 1 + Critical Updates via the Windows Update site. * I shut down the computer and installed the Adaptec card into one of the available PCI slots (slot #5, the bottom-most slot) ... no disk drives attached. * I restarted WinXP (should see Adaptec's RAID BIOS start message .. "Press to enter BIOS ..."). The operating system should detect the new hardware and prompt for a driver install. If not, open Device Manager (via Control Panel -> System -> Hardware tab), right-click on the unknown SCSI & RAID Controller item and select "Update Driver". "The error message is displayed because Windows XP recognizes the Highpoint chipset on the 1200A and tries to load the driver embedded in XP for the Highpoint chipset. This driver is no longer embedded in the operating system release, so no driver is loaded. 1) In Device Manager, right-click on the Mass Storage Controller entry under SCSI & RAID Controllers and select Update Driver. 2) Choose to "Install from a Specific Location", then select "Don't search. I will choose the driver to Install." For the hardware type, select SCSI and RAID controllers and click Next. On the next screen Press Have Disk, then Browse to the location of the 1200A drivers. The Adaptec 1200A should show up in the list of Models to select. 3) Choose the 1200A and continue. If prompted that this driver is not signed or may be the incorrect driver, say Yes to continue. 4) During the driver installation, you may receive a message that a file being copied is older than the existing file, do you wish to keep the newer file? Select to overwrite the existing newer file with the older version from the Adaptec 1200A drivers. If you keep the newer driver, your card will not function properly. 5) Once the driver for the 1200A is loaded, Windows should now detect another device, "Adaptec RCM Device". Repeat steps 2 & 3 for the Adaptec RCM Device." * Shut down the machine and plug the new, XP drive into the Adaptec card, channel #1. * Restart the machine and enter the BIOS ... set the Primary Master IDE Channel to "None"/"Off" and bring up XP (note: leave Secondary IDE settings alone because the CD and DVD drives are on these). The OS should now recognize the hardware as an Adaptec 1200a (instead of the generic Mass Storage device). Install the Adaptec GUI software from the CD. * Shut down the machine and plug the second hard drive into the Adaptec card, channel #2. * Restart the machine and enter the BIOS ... set the Primary Slave IDE Channel to "None"/"Off" and bring up XP (note: leave Secondary IDE settings alone because the CD and DVD drives are on these). * Open the Adaptec GUI (there should be a system tray icon per GUI install) and configure for RAID1 per instructions. Mirroring my 160GB drives took ~2.5 hours. Adaptec is reselling the Highpoint RocketRAID 100 as their own product. This is not a hardware RAID implementation, but the BIOS on the card support booting from the RAID array, which would otherwise be impossible using RAID0. The chip used (HPT370A) is nothing but a ATA100 controller, and can be used as such. All the magic is in the drivers. Adaptec only supports Windows OSes, but it actually works out of the box for FreeBSD, and Linux supports the chipset as well. I'm running a RAID1 configuration for a file server, using matched HDs. Read performance is noticably faster, and write performance does not seem to have suffered much. One issue: when one drive fails the RAID1 keeps on running, but rebooting requires manual intervention at the console until the drive is replaced and the mirror rebuilt. It's not an issue for me, but continuing the boot after a timeout would have been nice. I have a Compaq NT4 Server I have tried for two days to install this card. It does not work. NT4 does not recognise the driver on a fresh NT install. Worse still when I plugged hard drives into the card the my origonal raid array (which is rock solid) wasn't reconised as the boot device. Do yourself a favour spend a little extra cash and buy a card that works! This is a good solution for the home user who is looking for either faster transfers from his hard drives (RAID 0) or to secure his data (RAID 1). I use it on my Windows XP system and never had any problems. It's easy to install and configure. Windows XP supports it natively, but you should get the latest drivers and BIOS to support drives larger than 137GB.
. Doesn't offer RAID 3 (parity: 3 drives give you the capacity of 2 with the benefits of RAID 1) or RAID 5.
. In RAID 1 mode, it only supports 2 drives, even if you have 4. You cannot, for example, mirror a set of 200 GB + 60 GB drives to form a mirrored 260GB drive.
. No drivers offered for Linux. It is a good idea to read more about the different types of RAID before purchasing your RAID adapter. 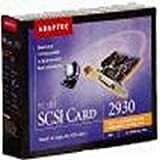 Adaptec is well known for their SCSI cards. They have been making them for years! This card is made to connect up to 7 devices, preferably Ultra SCSI devices carrying a max transfer rate of 20MB/sec. Be cautious, this card does not have a bootable BIOS ROM, so you can't boot from any device that is connected to this card. If you need to do so, purchase the AHA-2940. You can connect Zip/Jaz drives, CD ROM, CDR/CDRW drives, hard drives, etc. This card has an internal 50-pin IDC connector and one external HD68 connector. Easy to install and no problems encountered, highly recommended with 5 stars. I have been using this card for several years with a CD Recorder and CD ROM on a Windows 98 Machine. This device is anything but plug and play (check out the Google Groups pages). I was a bit wary installing this so I downloaded the latest driver for my unit and installed per the detailed 12+ step instructions on their web page. The end result was the "blue screen of death" forcing me to power cycle the computer just to get it to reboot (yes, I tried Crtl-Alt-Delete, but that didn't work). This began a 2 week series of try this, try that emails. I use a brand new Dell Dimension 8400 desktop with Windows XP Professional SP2. The end result is I that I still can't use my scanner. A search of Google Groups indicates similar problems with Adaptec's USB2xchange. 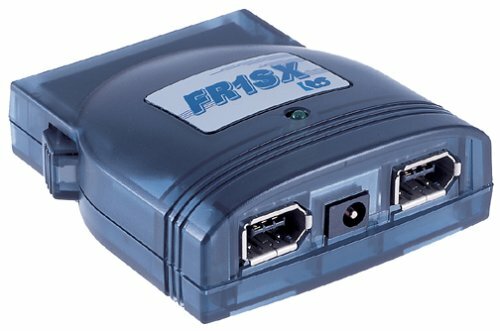 I bought this to run a Umax PowerLook scanner from an eMac. Software installed easily and I have had no problems scanning. It performs very well. Be careful with the driver installation. You have to install the Adaptec driver... otherwise the system will recognize the adapter as a storage device. 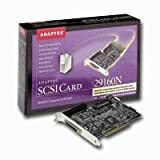 The Adaptec SCSI Card 29160N with its wide array of OS support is tailored to the needs of small multi-user work group servers and powerful workstation users who need to attach external narrow SCSI devices. 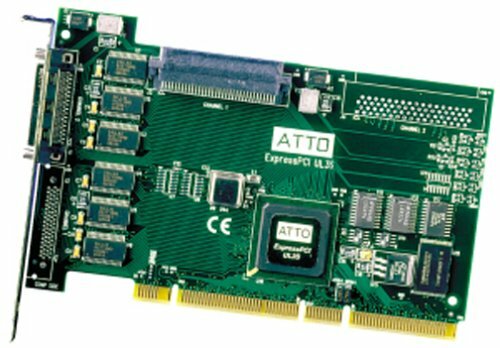 This 32-bit PCI card gets the most out of high- performance Ultra160 SCSI internal hard drives and popular external narrow SCSI devices.